Professor Agrawal received his MS and PhD degrees from the Indian Institute of Technology, New Delhi, in 1971 and 1974 respectively. After holding positions at the École Polytechnique, Paris; City University of New York, and AT&T Bell Laboratories, he joined the University of Rochester in January 1989. He is currently a Professor of Optics and a Professor of Physics. 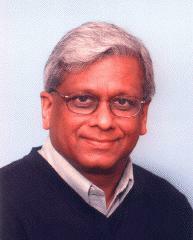 Professor Agrawal is a Fellow of both the IEEE and the Optical Society of America (OSA). He was a Topical Editor for the Journal of the Optical Society of America (JOSA B) during 1993-98 and is currently serving on the editorial boards of several journals and book series devoted to optics. Professor Agrawal's research interests are in the area of theoretical optics, particularly quantum electronics, nonlinear optics, and laser physics. He has made important contributions to the fields of semiconductor lasers, nonlinear fiber optics, and optical communications. He has authored three well-known books: Semiconductor Lasers (Kluwer Academic, 2nd ed. 1993), Nonlinear Fiber Optics (Academic Press, 3rd ed. 2001), and Fiber-Optic Communication Systems (Wiley, 2nd ed. 1997), and published in 2001 another book, Applications of Nonlinear Fiber Optics (Academic Press, 2001). He has also edited Contemporary Nonlinear Optics (Academic Press, 1992) and Semiconductor Lasers: Past, Present, and Future (AIP Press, 1995). He has published more than 300 research papers in various internationally reputed scientific journals.